This article is about the spiritual song. For the patriotic anthem with the chorus "Glory, Glory, Hallelujah", see The Battle Hymn of the Republic. For other uses, see Glory, Glory (disambiguation). "Glory, Glory" (also known as "When I Lay My Burden Down", "Since I Laid My Burden Down", "Glory, Glory, Hallelujah" and other titles) is an American spiritual song, which has been recorded by many artists in a variety of genres, including folk, country, blues, rock, and gospel. It is typically very melodically similar to another popular gospel song, "Will the Circle Be Unbroken". "I Trust (Everything Is Gonna Work Out Alright)"
(1971) "America's Great National Pastime"
^ "Night Train To Mephis review". AllMusic. Retrieved November 5, 2009. ^ "Larry Sparks – "Lay My Burden Down" lyrics". Poplyrics.net. Retrieved 2008-04-20. ^ "Will McFarlane – "Lay My Burden Down"". 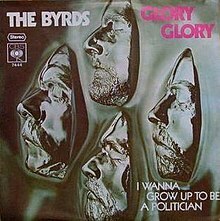 AllMusic: review of The Byrds' version of "Glory, Glory"
AMG: All performers of "Glory, Glory", "Glory Glory", "Lay My Burden Down"
This page was last edited on 22 November 2018, at 00:29 (UTC).